Gamers and comic-loving iPad owners may want to head to the App Store today, as Madden 25 is now available from EA, and Marvel's Marvel Unlimited app saw an update that allows users to store twice as many titles as before. 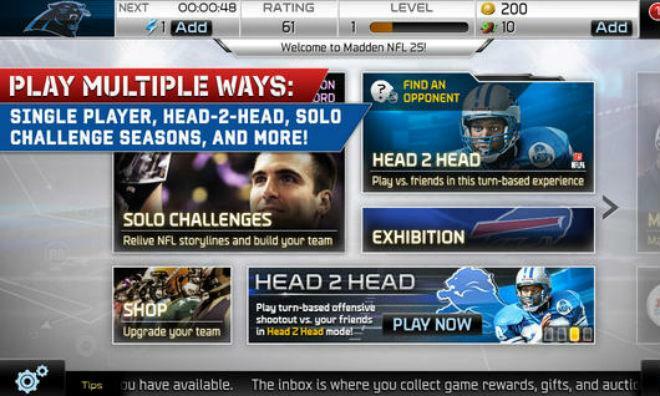 Video game football fans can now download Madden 25 for iOS devices. The new game is available in a "freemium" format: free to download, but with additional in-app purchases available. Madden 25 allows players to build their own ultimate NFL teams by collecting player cards gained either through buying packs or winning them at the Auction House. Those teams can then be taken onto the field against friends and other players online. The game includes multiple NFL modes. Players can relive NFL storylines, play through seasons in Solo Challenges, and take on friends in the offensive shootout mode, Head2-Head. They can also simply play exhibition games in single-player mode. The new Madden 25 is available as a free download in the App Store. The 702MB app requires an iPhone, iPad, or iPod running iOS 5.0 or later. Marvel's Marvel Unlimited app saw an update on Monday that finally addresses a long-lived user request. With version 1.2, Marvel Unlimited users can now store up to twelve comics for offline reading, twice the number they were able to store offline before. The update also adds the ability to browse comics by publication date in order to find a user's favorite comics from years past. Additionally, it fixes a number of bugs and adds other improvements to make the app experience smoother. Marvel Unlimited is available as a free download in the App Store, though the subscription service giving access to back issues is $10 per month. The 33.2MB download requires an iPhone, iPod, or iPad running iOS 5.1 or later.